The 14th World Scout Jamboree was held July 29 to August 7, 1975, and was hosted by Norway at Lillehammer, on the shore of Lake Mjøsa. 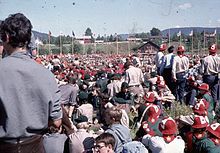 King Olav V and Harald V of Norway, who then was crown prince, opened "Nordjamb '75", as it became popularly known, in the presence of 17,259 Scouts from 94 countries. The slogan was Five Fingers, One Hand, an example of international cooperation on the part of the five Nordic countries responsible for its organization. The slogan for the Jamboree was represented in a number of ways, including one event that brought all of the Jamboree participants together into the central arena, where they formed a giant hand that was photographed from aircraft flying overhead. The Jamboree was also visited by Carl XVI Gustav of Sweden and Crown Prince Mohammed VI of Morocco. On August 2, 1975, the Jamboree County Fair was celebrated. For this event Nord Crowns were issued as Camp currency. ^ a b c "World Jamborees". The Scout Association. 2005. Archived from the original on 17 October 2008. ^ a b "World Scout Jamborees History". World Organization of the Scout Movement. Archived from the original on 7 December 2008. ^ a b Nordjamb -75 (TV documentary) (in Norwegian). NRK. 16 November 1975. Wikimedia Commons has media related to 14th World Scout Jamboree.